Just in the nick of time: South Africa debuts the Gautrain to transport World Cup fans into Johannesburg. Photo by fmgbain. 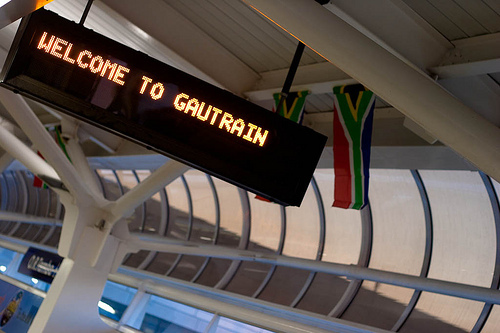 Just in time for the World Cup, Johannesburg debuted the Gautrain this week. The new train will carry fans wanting to avoid the city’s congested roads at speeds of up to 100mph. The high speed rail system is just one of the several projects in which billions of dollars have been invested to improve transportation for the global soccer tournament. Meanwhile, Johannesburg’s streets may be just a little less congested as 585 minibus taxis are removed from service and drivers are compensated with shares in the new bus rapid transit system. Copenhagen-style cycle lanes have caused a real stir in Melbourne. Outside of rush hour, the inside lane of traffic will turn into parking space, acting as as a buffer for the new bicycle-only lanes, confusing some motorists. As the Gulf oil spill continues to spread, Grist’s Jonathan Hiskes lists 10 solutions from the Smart Growth approach for reducing oil use in transportation systems as cities and towns continue to develop. Washington Post columnist Neal Peirce takes a look at the Obama administration’s “livability” initiative, an ambiguous and lacking term, in Peirce’s opinion, but as “American as apple pie,” with merit that makes it worth consideration as the United States looks to the future. The U.S. Senate is keen on the concept and moving legislation along. Transportation experts gathered in Delhi this week and looked to Singapore’s car tax as a model to curb traffic congestion and reduce air pollution in cities across India. Should the government focus on shifting ridership to public transport before imposing any tax on car users? If you’re not one to be constantly tuned in to C-SPAN, the cable network that airs non-stop coverage of U.S. government activities, you may have missed a Senator’s motion to strip the Environmental Protection Agency’s authority to use the Clean Air Act to restrict emissions of carbon dioxide. It’s an eternal battle: bicyclists/pedestrians vs. vehicle drivers. Well, New York City has sided with bicyclists and pedestrians, banning cars from designated areas in the city. With new bike lanes, pedestrian-only paths, and many other changes over the past two years, Manhattan is becoming a more mobile, active city. It’s every bicyclist’s nightmare: You’re riding down the bike lane that hugs the parking lane and a driver-side door swings open and the crash is unavoidable. The San Francisco Municipal Transportation Agency has set out to extinguish that fear through re-striping bike lanes with a “door zone.” Happy riding! Photosynthesis is the new black gold. Michal Vlček and Klavir have released designs for the world’s first photosynthesis-powered car. The Chinese have topped…themselves. The world’s fastest train was unveiled this week and is destined to be in service by 2011 in Shanghai. The train will reach speeds of up to 380 kilometers per hour (236 miles per hour), topping the former fastest train (also Chinese) by 30 kilometers per hour. Automobile drivers have been making use of GPS for years. Now, those who choose to travel by bike have a cycle-centric navigational system available for their GPS device or smartphone.